Yesterday, I did a post on making your own (cheap) coconut flour. That's nice and all, but once you've done that, you want to use it, right? The quick and easy way to use this flour, is to make pancakes. Crispy on the outside, nice and fluffy on the inside. 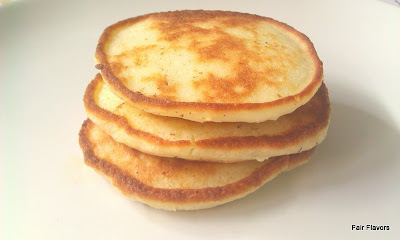 This paleo version has been done before, so this is hardly an original, but it's my favorite recipe for a basic pancake. Mix all the ingredients together thorougly. Heat your favorite fat in a skillet on medium heat, put a good spoon of the mixture in and carfully flatten the mix a little with the back of a spoon (the mix is less runny than traditional pancake batter, so you have to spread the mix a little) until your pancake reaches the size you prefer. Do this until you're out of mixture. How many pancakes you get out of it, of course, depends on the size you make them. Turn heat to very low and let them cook for a few minutes. Put a lid on the skillet. This "dries" them a little on top, so it makes them easier to turn. Once they have puffed and you start to see tiny holes on top (and there are no more very liquid area's on top), you can turn them over and cook for a minute or two more. Eat them with a good knob of butter or coconut oil. Have them with somer berries and a dollop of Greek yogurt or cream. Whatever you prefer! You could even make a sandwich with them. *Note: Don't put the heat too high, otherwise you will burn them at the bottom before they have a chance to dry on top. Worst recipe ever. Whole thing went in the trash. Waste of a ton of money. Too much coconut flour. Turn out like cement added 4cups of coconut milk to be consistency of pancake batter then didn't set up. I should sue you for the $10 I just wasted. I'm very sorry to hear that it didn't work out for you. I have to say (as it was brought to my attention in my "coconut cake" post), that it might be the kind of coconut flour we use. I based my recipe on the kind I use personally. I always make my own flour out of high fat dessicated coconut (Renuka). If you use a drier flour, the measurements are probably different.